This is a very easy recipe and can be prepared within minutes. Any kind of vatral (dried vegetable) can be used. Heat oil and add the seasoning ingredients. Fry till the mustard starts to splutter and then add the vatral and fry in low heat for about 10min. 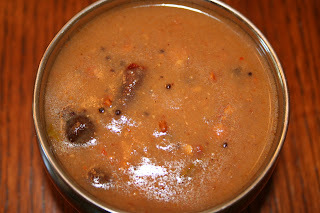 Add sambar powder and fry for 5min and then add the tamarind extract. Let it come to a boil. Mix rice flour with 1 tbsp water and add it to the boiling mixture. Allow to cook till it becomes thick. Remove from heat and serve with rice and papad. 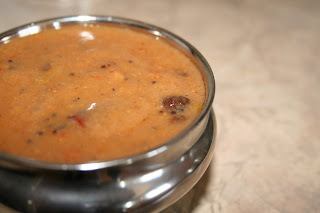 looks really combo..must have been great with rice...i love it..
nice kuzhambu..I have not made this till now.. 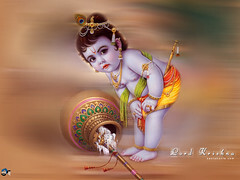 Thanks Sujatha, Ranji and Srivalli. WOW!.... This is my fav. I was searching for some good recipe of vatral kuzhambu. Have to try urs. I have never tried cooking with Sundakkai Vatral but will definitely try cooking with this!